Our credibility with conventional financing sources is outstanding. Our commercial funding sources know that we do not refer them into risky situations, so when those opportunities warrant a referral, they take it seriously. Accordingly, we are able to assist with obtaining the best possible commercial lending relationships satisfactory to both parties. 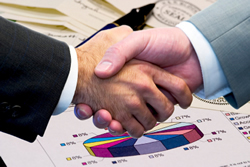 We strive to ensure that an excellent working relationship is established and maintained into the future. At Level Ten Consulting Group, we have worked with numerous distressed companies in the procurement of working capital and commercial financing.